To test if these features are indeed stable, Dediu employs a Bayesian phylogenetic approach to compare a large body of linguistic features and language families from WALS. Without going into specific methodological details, the current study uses “multiple software implementations, data codings, stability estimations, linguistic classifications and outgroup choices” to provide a greater degree of robustness. 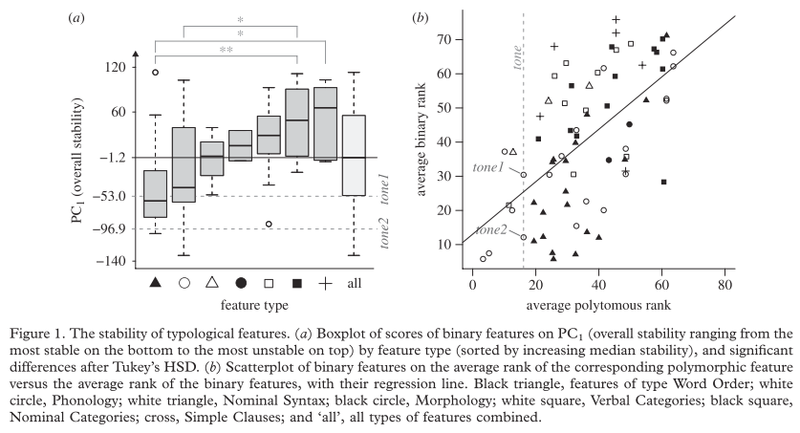 His general findings suggest linguistic tone is comparatively stable: both as a polymorphic feature (8th out of 68 polymorphic features) and in its two binary aspects (simple tone systems, 23rd out of 86; complex tone systems, 8th out of 86). Besides tone, the current study also turned up other interesting patterns. For instance, the presence of front rounded vowels appears to be extremely stable and shows a skewed geographical distribution, perhaps indicating a new case of genetic biasing. Dediu additionally points towards alternative methods to specifically test the genetic biasing hypothesis, such as correlated evolution (the extent to which change in one trait is associated with change in another). For now, though, I want to remain focused on tone. In particular, another new study by Javikivi et al (2010) draws into question some of the distinctions linguists make between tone and duration. For those of you who are relatively lay on the subject: speakers of tone languages use variation in the fundamental frequency (F0) to perceive differences in lexical meaning. Conversely, for those of us who speak non-tonal languages, such as English, the fundamental frequency is used in other functions (e.g. extra-linguistic aspects, such as emotional content). Another commonly made distinction are those languages where durational information relays these differences in lexical meaning. Finnish is a good example of this and these types of languages are known as quantity languages. One last point to make is how these phonological phenomena of segments, tones and length appear discrete and categorical, very much like colours in vision, yet this apparent conscious perception of speech sounds is actually continuous. Experiment 1 showed that, in addition to duration, participants’ categorization of syllables as long or short was robustly dictated by whether the relevant (first) syllable had a level or a falling tone corroborating similar observations in previous studies… More importantly, however, the result from Experiment 1 extended to Experiment 2 where we showed for the first time that the effect of tonality is not restricted to simple offline categorization, but is systematically and automatically used by speakers in rapid online word recognition to identify phonological quantity. In relation to Dediu’s current paper, and his previous work with Robert Ladd, the typological generalisations, which includes quantity languages in the non-tone sample, may need revising somewhat. With Jarvikivi et al.‘s results, the use of pitch to mark and process phonological distinctions does not necessarily mean a language is categorised as a tone language. A remedy to this problem, albeit one which is very difficult to implement, would be to directly test whether those genotypes associated with tone and non-tone languages are “equally sensitive to tone information without the confounding influence of language background entering the picture”. 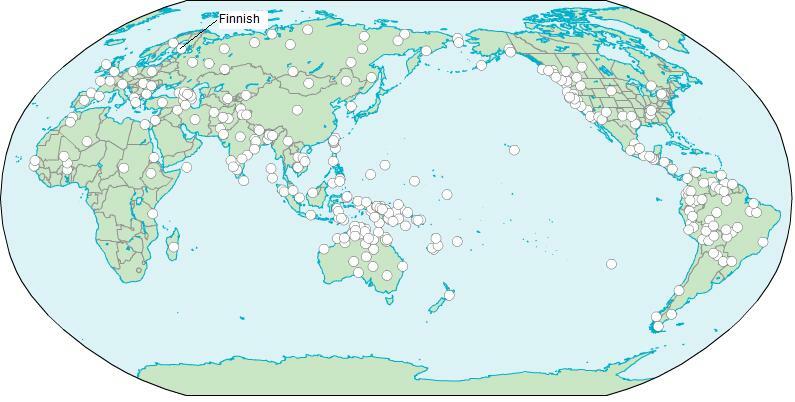 The geographic distribution of non-tonal languages taken from WALS. Note that Finnish is included in this sample. Thus, pitch sensitivity could be a continuous trait that affects cross-population variance with respect to the sensitivity to tone information; some speakers may carry alleles that make them relatively more sensitive to tone information; or, vice versa, Finnish speakers might carry alleles that make them less sensitive to tone information than speakers of tone languages. To conclude, if future experimental work confirms the results and hypotheses reported by Dediu, then approaches in linguistics and biology will be significantly altered. Still, even if it turns out the relationship between these two derived haplogroups and tone is non-existent, the overarching approach applied in this paper certainly warrants future investigation and elucidation. Nettle, D. (2007). Language and genes: A new perspective on the origins of human cultural diversity. Proceedings of the National Academy of Sciences, 104, 10755-10756. Hey Dorothy, I totally agree. I remember Nettle saying in his comment about it being hypothesis-generating, so ideally an experiment(s) needs to done.